"That's a once-in-a-lifetime experience," added Djokovic. "Hopefully the outcome can be the same for me." 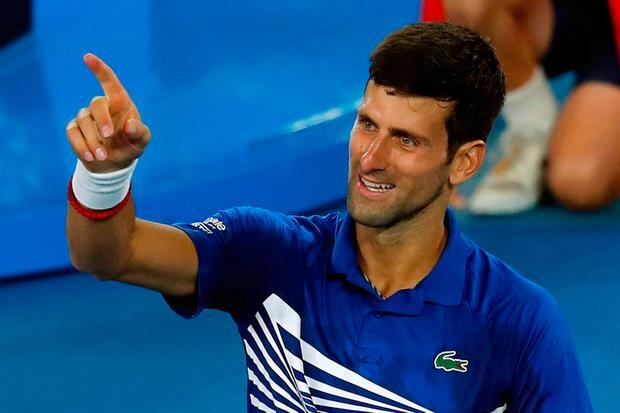 It will be a 25th slam final for Nadal and a 24th for Djokovic, who has won all six of his previous finals at Melbourne Park and can set a new men's record with a seventh. Djokovic's form, however, was red hot from the start. The top seed has had his struggles this fortnight, dropping sets against Denis Shapovalov and Daniil Medvedev, but it was as if he had seen Nadal's performance against Stefanos Tsitsipas and thought, 'anything you can do'. He will not admit it but wanting to show Nadal there are two men playing scintillating tennis ahead of the final was surely at the top of his mind, and poor Pouille bore the brunt. This has been the best slam tournament of the 24-year-old's career but he will look back on this night with no fondness whatsoever. Djokovic's record of 27 straight victories over French players at the slams was a warning and, from the moment he broke the Pouille serve in the second game, this was death by tennis ball. While Pouille tried and failed to locate the first serve that might at least have won him a few free points, Djokovic sent the ball arrowing onto the lines and into the corners. He hit 11 winners and only one unforced error - a drop shot he had no need to play - in the opening set, and his final tally of 24 to five told the story of just what a masterful performance this had been. Pouille's plight at least made him the crowd favourite, and there were wild cheers when he sent two forehand passes flying past Djokovic to get on the board in the eighth game. Instead of being a foothold, that turned out to be the highlight, and the only mercy for Pouille was that the end came quickly.